NORWALK, CONNECTICUT – October 12, 2005 – During the third quarter 2005, health care venture capital funding increased by more than 30%, compared with the year-ago quarter, according to Healthcare Corporate Finance News. In total, $1.7 billion in venture capital was raised by 97 health care companies during the third quarter ended September 30, 2005. Venture investing peaked during the first quarter, began to slow in the second and tapered off a bit during the third quarter, as in previous years. Seven health care companies closed rounds of $50 million or more each this quarter. Two pharmaceutical companies, Triax Holdings ($77 million) and Perlecan Pharma ($52.5 million), plus Cerexa, Inc. ($50 million), a biopharmaceutical company, closed their first rounds of institutional funding. Four more biopharmas closed third or later rounds: Replidyne, Inc. ($62.5 million), Affymax, Inc. ($60 million), Speedel ($56 million) and Amicus Therapeutics ($55 million). “Investors have not been swayed by the fickleness of the IPO market,” commented Ms. Swanson. “Many private health care companies are securing later rounds, and pharmaceutical companies continue to acquire biopharmas and biotechs or their compounds.” Six firms represent the most active health care venture capital investors of the third quarter ended September 30, 2005, based on participation in number of deals. Sprout Group, MPM Capital and HealthCap each made five investments, while Sanderling Ventures, Delphi Ventures and Johnson & Johnson Development Corp. each made four investments. Others, including Domain Associates, OrbiMed Advisors and Quaker BioVentures, each invested in three companies. Healthcare Corporate Finance News (www.hcfnews.com) reports bi-weekly on financial events in the fast-paced venture capital, private and public equity, and merger and acquisition markets. 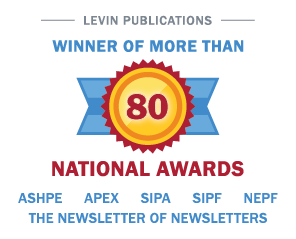 This well-researched newsletter is published by Irving Levin Associates, Inc., a leading financial publisher and source of market intelligence since 1948. For more information, please call 1-800-248-1668. THIRD QUARTER 2004 HEALTH CARE M&A DOLLARS 11% HIGHER THAN LAST YEAR ACCORDING TO NEW REPORT FROM IRVING LEVIN ASSOCIATES, INC.